Stand up, People! – There is no doubt that Lenin Moreno, the new Washington implant in Ecuador, is not only a coward but a criminal in terms of human rights abuse. He knows that Julian Assange faces extradition to the US, torture and possibly the dead penalty. 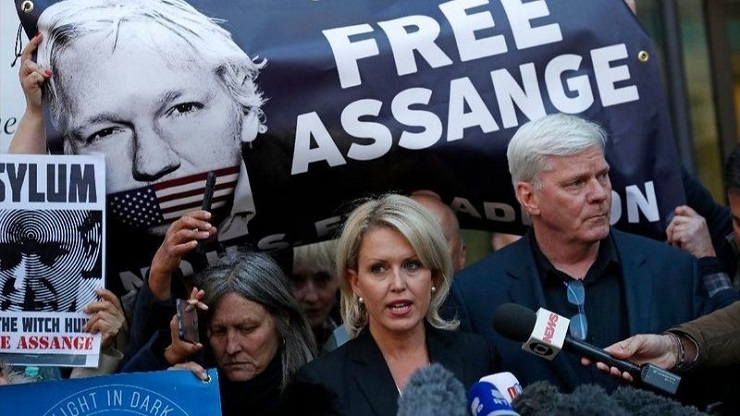 He knows as he made a deal with Washington to get Assange eventually back to the US to stand trial – and very possibly being tortured. Chelsea Manning, an intelligence analyst in Iraq at the time, is said having supplied Wikileaks the bulk of information, the TRUTH about a criminal US regime, about its war crimes, is currently also in jail, certainly not by coincidence. The two will serve the world as examples – you better behave, and do not interfere with our attempts whatever illegal form it may take, to take over the world, to reach in the shortest time now, world hegemony. Crimes on humanity, like those committed in Afghanistan, Iraq, Syria, Palestine, Yemen, Venezuela, Cuba, Sudan, Pakistan – and the list goes on – are part of the plan to subdue humanity and eventually Planet Earth – to the will and whims of empire, helas, a failing and faltering empire, that thrives for the benefit and greed of a few weapons and financial oligarchs, hence, the speed with which empire now operates. When you eventually succumb to human justice, to nature’s justice, a justice way above that fake, servile, man-made justice – then you know it, and then – destroy whatever you can before, so that nobody can survive. It’s akin to a wild animal before dying – lashing out around itself – to bring down whatever it can before biting the dust. Our western world is becoming ever more honest – showing its true face – namely abject inhumanity, the criminality runs down the western face like tears of joy – albeit tears of blood. Who even dares still using the terms of freedom, democracy, freedom of speech? Believe me, there are still people in this world of comfort, of no-care-for-the-next – that trust life in the west is heaven of justice of democracy. Never mind that justice is trampled with boots and guns and bombs – if that’s not enough – fly in NATO, the all destructive force, run by the Pentagon and subscribed to by 27 European countries – out of 29; the others being the United States and Canada. Doesn’t that say a lot? – Well, it’s in our hands to change it. That’s the case of the European Union. The EU, and all associated nations, is run by the Pentagon via NATO. The EU could have said “stop” to the arrest of Assange on their, EU’s territory. The people of the EU should just take this as another example how Brussels is a mere and miserable vassal of Washington’s, unable to defend their sovereignty, the right of their citizens, and the right of those that defend freedom of speech, a nominal, albeit farcical, priority of the EU. Nobody interfered, with this abject and blood thirsty arrest in the morning of 11 April. Brussels was silent. No surprise there, but again, a huge deception by the rulers (sic) of Europe. Is it a coincidence that 11 April was also the day of another Washington initiated murderous act? – On 11 April 2002, 17 years ago, Washington conspired and orchestrated directly, live, via video, the attempted coup in Caracas against Venezuela’s democratically and overwhelmingly elected President Hugo Chavez. The coup failed, as Chavez then – and as President Maduro today – had and have the massive support of the people and the military. On 13 April, at the forceful request of the people, the “golpistas” had to assume their failure and President Chavez returned from his two-day exile on La Orchila island, a military base, where he was flown by helicopter. That’s the way justice goes in our western world. Disrespect for human rights, for human lives for the rights and independence of other people on the globe from Asia, to Africa to Latin America has been – and still is – a historic truth. Europe turned their colonies into slavery. Why would they behave differently now? Sadly, the human condition of Europeans, of the West – after all, North Americans are nothing but transplanted Europeans – has not changed. Does it take a total demise for people to come to their senses? In recent years, this impunity has turned into a bold, flagrant openly demonstrated crime for all eyes to see, eyes that still have some iota of conscience left. Haven’t you noticed, People of the west, of the comfortable west? It’s high time to react. If you don’t, you may be next, that is as sure as day follows night. The hegemon will not stop to protect you in your comfort zone. Comes the time, you are no longer needed, when all your resources – including your drinking water – are under full control of a few corporate oligarchs.